I actually tried to tell a young guy about what a fabulous app this is, but he told me he really couldn’t resonate with the concept. That’s ok, because this app was designed by women, for women. It is a personal protection iPhone app that can be customized to meet your particular safety needs. You can find the app in the Apple App store (the Android version is still in development). Search for WatchMe 911. Although set up is very intuitive, this app actually has a printable “Quick Start Guide” – a nice feature for folks, like me, who still like to read the manual. • Everyone who downloads the app gets the free “911 Only” feature. As the name implies, activating this feature results in a call to 911. I have placed the WatchMe 911 icon on the opening screen of my iPhone with nothing else around it. A tap on the icon, brings up a menu of icons, with the Call 911 Only icon smack in the center in a bright yellow triangle. A double tap on the icon places a call to 911. That’s great, really great, but I prefer the more advanced features of the app, such as the “Panic” mode, that offer me the ability to include my selected contacts in the notification process. I think these features provide an added bit of safety in case the 911 response is not exactly what you had hoped. • The “Panic” mode sends texts and emails to whomever you select in the setup. In addition to sending your contacts a written message, such as “I need help NOW,” the app also sends them your GPS location (if activated). This is the mode to use when you feel especially vulnerable…say walking down a dark street alone or getting out of your car in an empty parking garage. Once you set the Panic mode, it will stay on your phone until you deactivate it by sliding the “Exit Panic Mode” arrow. • The “Monitor Me” mode is “a safety net for ‘what ifs’ of everyday activities.” These are times when you think everything should be ok, but you aren’t really 100% sure – let’s say the first meeting with a guy you met on an internet dating service or that solo run through the forest that no one else wants to do. You don’t really want to alarm your friends ahead of time, but you want the peace of mind knowing that you can reach out to them if things “go south” – as the Quick Start Guide notes, this is a “just-in-case-of-emergency plan.” To use this feature, you pre-select who you would like to be notified and what you would like to tell them (e.g., “on a date with Jack D. Ripper. Call me, then 911.”) You then set a timer that reflects when the message would go out….say 30 minutes into the blind date or just after you think the run would be completed. The app will notify you when the timer runs out via a popup, an alarm and vibrate. You then have 15 seconds to cancel the alert. If you fail to cancel the alert, the WatchMe 911 servers will send out your messages and GPS location to your contacts. This will happen even if you don’t have internet or your phone is destroyed. • The final feature, “I’ve arrived” is for those times that your friends and family have said, “Now, remember, call me when you get there so I don’t have to worry.” Yes, you can call them one by one, or you can use this feature to notify them all at once via text and/or email. Each of the personal safety modes can be customized by setting up “Watches.” You type out a message and select the contacts you want notified for each personal safety situation. Say you are leaving the office late at night and want backup in case something scary happens as you walk to your car. You can set your co-workers, still in the building, as your contacts and you can tell them “I’m in trouble, call me, call 911.” They are the folks closest to you in that particular circumstance and can, therefore, be first on the scene to help you out. The App comes with some great Alarm sounds that can be activated when you hit the Panic button or it you tap the Alarm icon directly. My personal favorite is the Police Siren (three different versions). But you can also chose the commanding male voice, very police-like, saying “Stop. 911 has been called” or the screaming woman, the barking dog or the weird buzzing alarm sound. You can also activate the flashlight function that could cause a bit of a panic in anyone up to no good. Now, you may think that an app like this was designed by a Silicon Valley techie feminist, but you would be wrong. In fact, it was developed by a Tax and Finance businesswoman and grandmother! I had a chance to chat with Founder, Jill Campbell, and was impressed with her vision and dedication to improving the safety of women via a well-thought out and easy to use app. Now I do have to warn you that there is a subscription fee for activating features other than the always free “Call 911 Only.” It costs $.99 to activate the alarm and flashlight feature of the WatchMe 911 (worth everyone of those 99 pennies) and $9.99/month to activate all of the alert modes – a bargain when you consider that we are talking about personal safety here. Both the WatchMe 911 and the OnWatch apps come with a free trial period. So, Ladies, do mosey on over to the App Store and download this app. And get your moms, sisters, daughters and granddaughters to do the same. At last, we can be Armed…with an App! 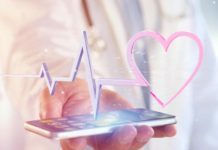 Great article on how to leverage technology for not only safety, but also for those with health issues who may need monitoring too. I have already posted this article you wrote on FB and plan on having my family download this app today!